Parsley is a bright green herb native to the Mediterranean region and cultivated throughout the world. Used both as garnish and an ingredient, parsley comes in several different varieties. 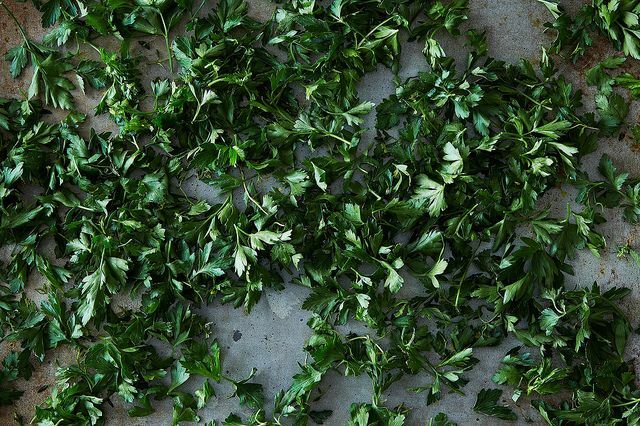 Flat-leaf parsley, also known as Italian parsley, has large, flat leaves and adds robust flavors in cooking (think soups, stews, and sauces) while curly parsley is primarily used for decoration. But it’s more than just a pretty face. Per tablespoon of chopped herb, parsley contains just 1 calorie and no fat or cholesterol. It contains less than 1 gram of carbohydrates, fiber, and protein but it is fairly rich in Vitamins A, C, and K as well as trace minerals like potassium, calcium, magnesium, and iron. Parsley also boasts several volatile oils which have natural anti-inflammatory properties in addition to their antimicrobial and carminative benefits. When it comes to parsley for dogs, you should only feed the curly variety. Watch those serving sizes, as parsley does contain a toxic compound called furanocoumarin which can be dangerous in excessive amounts. In smaller servings, however, parsley does your dog more good than harm. Wondering how to incorporate parsley into your dog’s diet? He may not chomp down on a fresh bunch right off the bat, but adding a little to his regular food a few times a week should do the trick. If you’re concerned about accidentally giving your dog too much parsley, play it safe by blending with water (1 teaspoon per 20 pounds of bodyweight) and creating a juice you can pour right into your his water bowl. You can also brew parsley root into a tea (1 teaspoon per 10 pounds of bodyweight), or bake some into homemade dog treats. A new twist on tea and cookies for the whole gang. Why Does My Dog Steal Socks?